(Bloomberg) -- U.S. Homeland Security Secretary Kirstjen Nielsen, a lightning rod for criticism within and outside the Trump administration over policies on the southern border, is leaving her position, President Donald Trump announced on Twitter. Kevin McAleenan, Customs and Border Protection commissioner, will become acting secretary, Trump said. Trump met with Nielsen early Sunday evening and she was asked to resign, according to four people familiar with the matter. The president has also recently directed White House adviser Stephen Miller -- an immigration hardliner -- to take on a larger leadership role because of frustration that the border issue isn’t being solved faster, the people said. The president wants a strong, law enforcement-type figure in charge of Homeland Security because he associates the sprawling department -- created after the Sept. 11 terrorist attacks -- mostly with border issues and not with its other missions such as cyber security, airport screening and natural disaster response, the people said. Nielsen’s departure comes after Trump renewed his public expressions of frustration about security at the U.S. southern border, including during a visit to California on Friday when he declared the U.S. “full” and unable to accommodate any more migrants from Latin America. Trump, Nielsen, and McAleenan jointly participated in a roundtable discussion on border security at a border patrol station in Calexico, California, on Friday. In their remarks, Trump and Nielsen thanked the other for making the visit. “We’re going in a tougher direction. We want to go in a tougher direction,” Trump said Friday of Ronald Vitiello, the acting director of the immigration agency. Last week, Trump threatened to close the U.S. border with Mexico to stop a spike in migration. Customs and Border Protection apprehended 66,450 who crossed the border illegally in February, an increase of more than 18,000 from the month before. Nielsen was responsible for carrying out some of Trump’s highest-profile campaign promises, including efforts to build a wall along the southern border and getting more National Guard forces deployed to stop illegal immigration. Trump reportedly had previously considered removing Nielsen in frustration about the porous southern border. The president and other White House officials have been frustrated by the slow, tangled process to move new immigration proposals through the government, which often requires sign-off from as many as four different cabinet agencies. The secretary also faced criticism from other administration members. National Security Adviser John Bolton told Trump several months ago of his concern that the president wasn’t been well served by Nielsen, said a person familiar with internal deliberations who asked not to be identified. Those concerns were behind a reported shouting match outside the Oval Office in October between Bolton and John Kelly, then the White House chief of staff. Nielsen, 46, was a protege of Kelly, who departed the White House in January. Nielsen faced criticism from Trump over things she couldn’t control, such as court rulings against his plan to end the Deferred Action for Childhood Arrivals immigration program, his ban on refugees from predominantly Muslim nations, and a perceived inability to effectively secure or choke off border crossings. At the same time, she endured harsh criticism from Democrats for her handling of immigrant family separations. Criticized by the president during a cabinet meeting last May, Nielsen considered submitting her resignation at that time, according to the New York Times. Her office called the reports false. 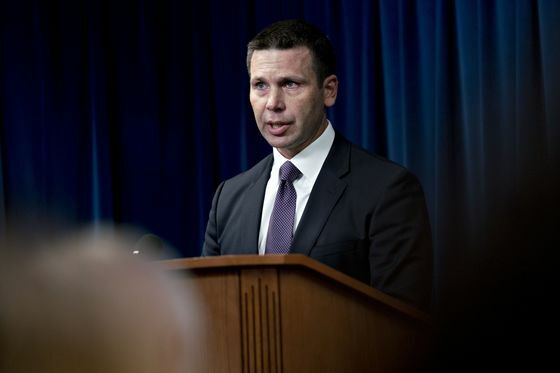 McAleenan, 47, was sworn in March 2018 as commissioner of Customs and Border Protection after serving as acting commissioner at the start of the Trump administration and previously as deputy commissioner. In her resignation letter, Nielsen detailed her legacy as secretary across the range of Homeland Security operations, including action on the border, natural disasters, cybersecurity, thwarting terrorists and deterring enemies. While some Republican lawmakers praised Nielsen as she departed -- West Virginia Republican Senator Shelley Moore Capito termed her “a strong and thoughtful leader” -- others were restrained. Senator Ron Johnson of Wisconsin, chairman of the Homeland Security and Governmental Affairs Committee, didn’t cite Nielsen by name in a two-sentence statement calling for “steady, informed and effective leadership” on border security. 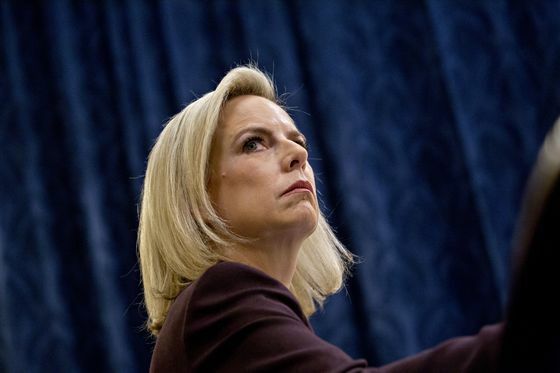 On the Democratic side, Representative Bennie Thompson of Mississippi, Chairman of the House Committee on Homeland Security, said Nielsen’s tenure “was a disaster from the start.” Yet, he added, she should not serve as “a scapegoat” for Trump’s immigration and border policies. “It was long past time for her to go,” Harris said.